The two central works in the first half complemented each other, both playing with ideas of semantics and meaning. 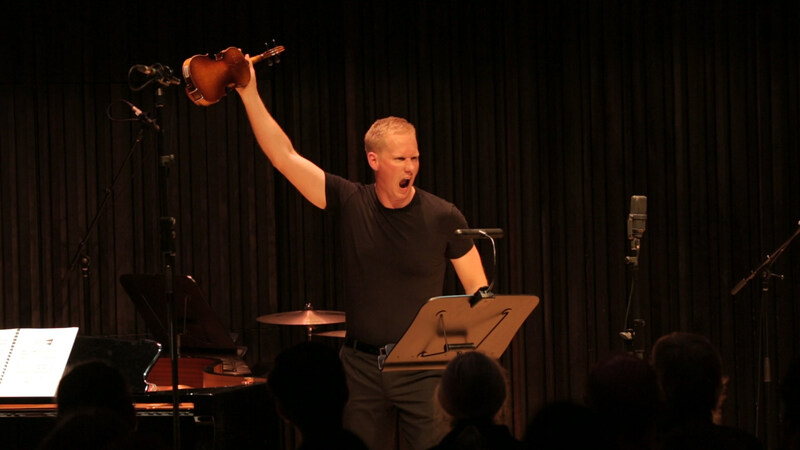 American composer Jason Eckardt’s Dithyramb, performed here by Sheldon, is an outburst of nonsensical vocal sounds inspired in part by an ancient Greek hymn. More, a new work by Natasha Anderson receiving its world premiere by Aszodi, used more substantial textual material for a fairly similar musical effect. Anderson has taken text from medieval music, personal accounts of abuse and recollections of a woman who underwent exorcism. These sources were chosen to foreground ideas of the feminine and violence and, in turn, the shortcomings of language to communicate these experiences. The disordered layering made for thrillingly uncomfortable listening, with the performer required to draw on a range of vocal techniques and emotions. Aszodi was masterful in the way she dealt with the competing ‘voices,’ especially in sections with splits between sung and whispered text—truly giving the impression of multiple performers. Considering Peter Maxwell Davies’ Eight Songs for a Mad King is nearing its 50th anniversary, it’s remarkable that its theatricality can still shock. The intimate space of the Melbourne Recital Centre Salon perhaps enhanced the confronting aspects of the work, given the audience’s proximity to Matthew Thomas’s wailing, snarling, violin-breaking King. Thomas put on a commanding display, acting the part but rarely overdoing it. His performance induced a great deal of empathy, not an easy feat considering the musically exaggerated depiction of madness. The dark humour of Davies’ parodic musical score was captured by the ensemble, providing fleeting relief from the visceral intensity of Thomas’s portrayal. Jack Symond’s thumping rendition of familiar strains from Handel drew muted chuckles, as did the bird-like duet featuring flautist Eric Lamb. Odeya Nini’s A Solo Voice is an ongoing work, in which Nini explores the relationship between voice, body and mind. The section presented at Resonant Bodies, New Found Land, mused on Nini’s new experience of motherhood. In broad terms, the work can be considered in two sections: the first using only the voice and movement, and the second adding pre-recorded tape. A particularly effective part of the first section was a burlesque expression of sensuality and pleasure. It was disarming to see a woman gyrating alone on the stage, with no musical backing apart from her own voice, toeing a line between empowerment and vulnerability. But other parts of the work’s structure weren’t as gripping, and perhaps too much time was spent developing short riffs and repetitive breathing patterns. The entrance of the tape track in the darkened room provided a warm and comforting resonance. Nini fitted her live voice within the manipulated instrumental layers to create enjoyable moments.